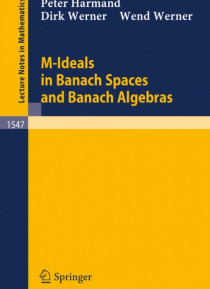 This book provides a comprehensive exposition of M-idealtheory, a branch ofgeometric functional analysis whichdeals with certain subspaces of Banach spaces arisingnaturally in many contexts. Starting from the basicdefinitions the authors discuss a number of examples ofM-ideals (e.g. the closed two-sided ideals of C*-algebras)and develop their general theory. Besides, applications … toproblems from a variety of areas including approximationtheory, harmonic analysis, C*-algebra theory and Banachspace geometry are presented. The book is mainly intended as a reference volume forresearchers working in one of these fields, but it alsoaddresses students at the graduate or postgraduate level. Each of its six chapters is accompanied by aNotes-and-Remarks section which explores furtherramifications of the subject and gives detailed referencesto the literature. An extensive bibliography is included.